Anxiety and fatigue can range from mild to severe, inhibiting the ability of the sufferer to carry out daily tasks. Unlike the occasional nervous feelings everyone experiences, anxiety is a defined as a psychological state that is characterized by the intense feelings of worry. Fatigue refers to the feeling of weakness, exhaustion, and decreased energy levels. 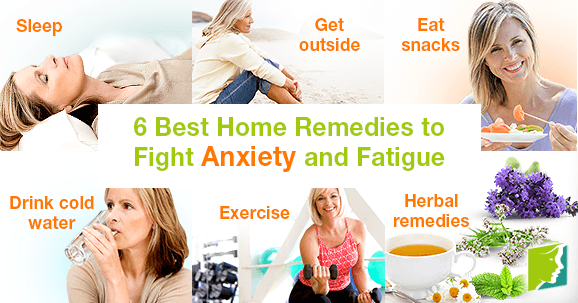 Fortunately, there are numerous home remedies to fight anxiety and fatigue. The leading cause of anxiety disorders in women is hormone fluctuations experienced during menstruation, pregnancy, and menopause. Anxiety symptoms can be categorized into either physical or psychological. Fatigue can be caused by lifestyle factors like high stress, poor diet, or insufficient exercise. Hormone fluctuations and insufficient sleep can also cause fatigue. Fatigue occurs when the body has to work harder than usual to carry out everyday activities, and is directly linked to lack of rest. Fatigue can cause symptoms like difficulty concentrating, irritability, and headaches. Getting adequate sleep is crucial to feeling good and maintaining high energy levels throughout the day. The average adult needs between seven and eight hours of sleep every night. Taking a warm bath, reading, and meditating before bed are all helpful tips to getting a good night's sleep. Most people with depression also have low levels of vitamin D, a nutrient the body produces when it is under the sun. When you are feeling fatigued and cooped up inside, try taking a brisk walk outside and get some fresh air. Research has shown that eating small, healthy snacks every three to four hours in addition to regular, balanced meals can help boost energy levels. Blood sugar levels drop when you skip meals, which is a leading cause of fatigue. A piece of fruit, low-fat yogurt, or whole grains are all nutrient-rich, energy-boosting snacks. A study conducted at the University of Chicago found that drinking cold water invigorates the mind and stimulates bodily functions. Drinking cold water has a similar (albeit lesser) effect as jumping into a body of cold water. Consuming the equivalent of eight glasses of water throughout the day also helps boost energy levels. Also try to avoid excessive caffeine consumption, which leads to fatigue and amplifies anxiety symptoms. Studies have shown that regular exercise can increase energy levels up to 20% and also improve mood and bodily functions. The general recommendation is to get around 30 minutes of aerobic exercise a day. Biking, walking, and swimming are all excellent low-impact workouts that can help fight anxiety and fatigue. Herbs with strong sedative characteristics have been shown to help ease anxiety symptoms, calm the nerves and alleviate restlessness and nervousness. Chamomile, lavender, hops, valerian, lemon balm, and passion flower are all calming, sedative herbs that are widely used for treating anxiety disorders. These herbs may be taken in supplement or extract form, or you can add these essential oils to a warm bath. Anxiety is a mental condition that can interfere with everyday life and affect personal relationships. Fatigue can range from mild to severe and inhibit the ability to carry out daily tasks. There are several home remedies that have been shown to be beneficial, and are cost-effective and easy to incorporate into a daily routine. It is important to try out different treatments and find the option that works best for you. What You Can Do about Tiredness from Anxiety? Read all about anxiety in 46-year-old women here, including the factors leading to this mental health condition and effective treatment options to battle it. Read all about hormones and vitamins for menopause anxiety in addition to other management and treatment options to finally enjoy a worry-free life. Anxiety is twice as likely to affect women as it is men, and this psychological problem can be even more common during menopause. Anxiety is twice as likely to affect women as it is men, and this psychological problem can be even more common during menopause.